High street store Republic houses numerous brands. Their Spring/Summer campaign highlights some of this seasons hottest trends. It's somewhere I'd overlooked in the past when out shopping but after exploring their new collection I'm sure I'll be visiting more in future! 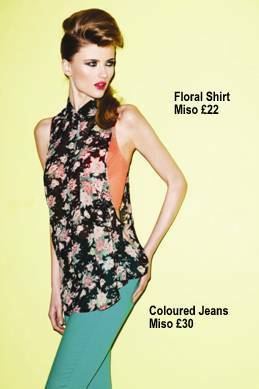 Soul Cal, Crafted, Miso and White Label have put together some key looks for Spring/Summer featuring bold bright colours and prints perfect for summer days! Bold stars and stripes prints feature heavily throughout the collection. These outfits make me long for a summer road trip! A graphic print jumper paired with denim cut offs is perfect for relaxing in the park. The floral vintage style playsuit is ideal for a day at the beach. Add a bleached look denim gilet and some accessories and you're ready to hit the shops! The Americana look is toughed up and adapted to be suitable for a smarter occasion by adding another summer staple, a bold coloured blazer. I love all the aztec prints in the shops at the moment. The geometric patterns can jazz up a plainer outfit and are perfect for festival chic style. The sleeveless embellished shirt is great for layering over tops or dresses. The embroidered print detailing is a subtle way of trying out the trend. I've been looking for some aztec tops and the ombre aztec vest is going straight to the top of my wish list! I love the design and ombre effect with the colours. The aztec print jeans are perfect for creating a bold statement look. Style with a simple white shirt to let the pattern stand out. I have lots of floral prints in my wardrobe and love the idea of teaming them with bright neon colours to update them for the season. One of my favourite pieces from the collections is the floral shirt. It looks great paired with coloured jeans and I'm sure it's something I'd wear again and again. The pastel pink jeans are the perfect way to incorporate this seasons popular pastel trend into your wardrobe. Try out this season's new dipped hem style mixi skirt with a classic floral print. The aztec print maxi dress would be great to take away on holiday, it'll see you through a day out sightseeing to dinner and drinks in the evening. What will you be buying for your summer wardrobe? I always forget about Republic, think I only have a couple of pieces of jewellery from there! Love that Aztec vest though! Really impressed with Republic atm! Went in the other day and saw some of the gorgeous things you've showcased and was simalrly impressed! Love the mix of patterns! My closet is seriously lacking in floral prints and pastels. I am going shopping this weekend with the hopes of adding a few pieces for Spring. I went into Republic today and saw some lovely floral pieces...ahh I should have bought them! And I'm all over that denim jacket with leather sleeves like a rash! And it's such good value too! Perfect SS12 jacket! It's not really my style, but there ARE a couple pieces here I am now desperate for. Those double-strap mary janes are so precious and pretty and adorable, and that PU sleeve denim jacket is badass and tough. I'd wear both of those constantly.